End Juni 2016 it was time to get things really going. I ordered a IdeeTron Lorank8 which after 2 days got deliverd at my work. My current plans are to test the Lorank8 before perament installing it. This is because being a hamradio operator I also make on the variouse hamradio bands (including 70cm). So before I put the Lorank8 out in the field (eh build my self a external 868Mhz antenna and install it outside), I want to be sure that the input amplifiers of the Lorank8 will survive my transmitions. Maybe I have to make a 868Mhz Interdigital Bandpass Filter for supressing signals outside the 868Mhz band like 2m, Wifi, GSM, BT etc. For my 70cm hamradio transmitions (the 2e harmonic will fall in the 868Mhz band) it will be a little bit harder. But hamradio is all about experimenting so maybe I have to add a 70cm Interdigital Bandpass to my 70cm hamradio station to supress the 2e harmonic even more. 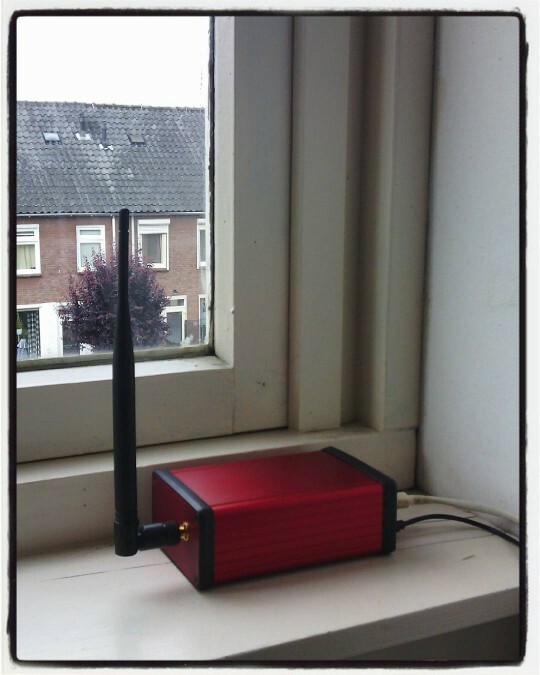 When all the tests are done and 100% pass, I will set it up permantly with a external antenna. But I allready have add the router the Almelo Community page and when I'm not making hamradio transmitions it will be Active. I programmed one of my DIY nodes and the packages came in nicely. Check it out at the Semtech routers status pageand the TheThingsNetwork gateway API page of this router. The gateway is doing a fine job, but having it locates in the window (point south) isn't a good idee. The I started to look for a external antenna, and being a Hamradio operator . . . DIY is the way to go. Next step : get more dB gain with a new antenna. Info : There is a other great tool to get info about you gateway : TTNMapper. It's a Android app which you can install in you're smartphone and combined with a node it gathers info about you're gateway coverage (FAQ). I used it a few times to create a map of the coverage from my gateway. The result can be found here : link.